Boralesgamuwa, Sri Lanka is on the Colombo-Horana Road about 14 km south-east of the commercial capital Colombo. The Boralesgamuwa junction was formerly known as Nagass Handiya. One of Sri Lanka's largest kaolin deposits is in Boralesgamuwa. The Bellanwila Rajamaha Viharaya is very close to the Boralesgamuwa town. Bellanwila Rajamaha Viharaya is a Buddhist temple situated in Bellanwila, Colombo District, Sri Lanka. Located around 12 km south to the Colombo city, near Dehiwala - Maharagama road, the temple attracts hundreds of devotees daily and is famous for its annual Esala Perehera festival which usually takes place in the month of August or September. One of the most venerated Buddhist temples in Sri Lanka, many devotees flock to worship the sacred Bo tree of Bellanwila Rajamaha Vihara, which is considered to be one of the first offshoots of Jaya Sri Maha Bodhi in Anuradhapura, Sri Lanka. The present chief incumbent of Bellanwila Rajamaha Vihara is Ven. Bellanwila Dhammaratana Nayaka Thera. The post code of Boralesgamuwa is 10290. Attidiya Bird Sanctuary is the natural sanctuary closest to Colombo. Katunayake, is a suburb of Negombo city in Western Province, Sri Lanka. It is the site of Bandaranaike International Airport or Colombo Airport, the primary international air gateway to Sri Lanka. With the change of government in 1977 and the introduction of the open economy policy a large area was allocated to create a free trade zone. This created a large number of job opportunities for the local youth and has contributed substantially towards the country's economy. Udawattakele Forest Reserve, often spelled as Udawatta Kele, is a historic forest reserve on a hill-ridge in the city of Kandy. It is 104 hectares large. During the days of the Kandyan kingdom, Udawattakele was known as "Uda Wasala Watta" in Sinhalese meaning "the garden above the royal palace". The sanctuary is famous for its extensive avifauna. The reserve also contains a great variety of plant species, especially lianas, shrubs and small trees. There are several giant lianas. Many of small and medium size mammals that inhabit Sri Lanka can be seen here. Several kinds of snakes and other reptiles might be seen. Udawattakele was designated as a forest reserve in 1856, and it became a sanctuary in 1938. Colombo - Katunayake Expressway E03 is Sri Lanka's second E Class highway. The 25.8-kilometre-long (16.0 mi) highway links the Sri Lankan capital Colombo with Bandaranaike International Airport, Katunayake and Negombo. Construction on the highway began in October 2009, and it was opened on 27 October 2013, by former president Mahinda Rajapaksa. The highway has three lanes each way from Colombo to Peliyagoda, and two lanes each way from Peliyagoda to Katunayake, with the width ranging from 26 to 33.5 metres. The Civil Aviation Authority of Sri Lanka (CAASL) oversees the government approval and regulation of civil aviation matters for the nation of Sri Lanka. Its head office is in Katunayake as of 1 February 2018. Kohuwala is a suburb in Colombo, Sri Lanka and is situated where the Colombo Piliyandala Road crosses Nugegoda Dehiwala Road. 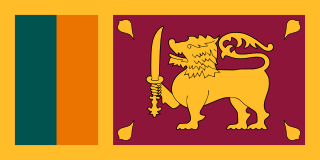 Hence it is connected to Nugegoda, Dehiwala and /Pamankada/Colombo and Boralesgamuwa/Piliyandala. Kohuwala is very close to Colombo South Teaching Hospital, Kalubowila. Kohuwala is inside the administration boundary of Dehiwala-Mount Lavinia Municipal Council. The Japanese School in Colombo is a Japanese international school in Colombo, Sri Lanka. It was established on 2 September 1966. It was previously located elsewhere in Colombo. Kahathuduwa is a small town in the Colombo District of the Western Province of Sri Lanka. It is located approximately 28.3 kilometres (17.6 mi) south east of Colombo, the capital city of Sri Lanka. Malani Bulathsinhala was a Sri Lankan classical musician. She began her musical career at age 10, as a child artist with the Sri Lanka Broadcasting Corporation. San̆davaṭa Rantharu was the first of her contributions to Malini songs. She also served as Assistant Director of Education in the western Sri Lankan province of Sri Jayewardenepura Kotte. Giritale is a small city in the Polonnaruwa District of Sri Lanka. The location has tourist attraction due its nature and close link with Polonnaruwa, an ancient capital of Sri Lanka. Giritale has some mid-range and up hotels. It is situated on the main road from Colombo to Polonnaruwa and Batticaloa.